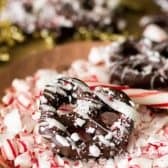 These peppermint bark pretzels are an easy, 4-ingredient holiday treat that double as a sweet edible gift! 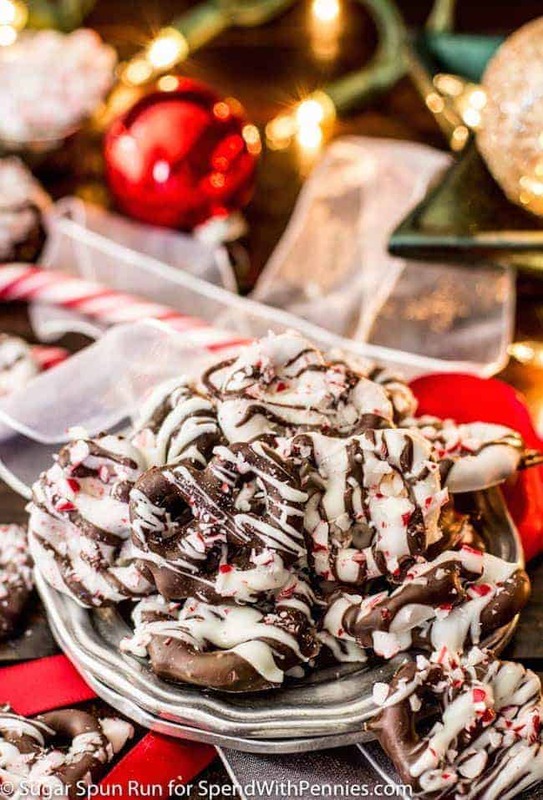 Take chocolate covered pretzels to the next level by drizzling with white chocolate and sprinkling with candy cane pieces! This holiday season I’m trying to keep things as simple as possible. While I’ll admit that I’m more than a little bit behind in my Christmas shopping, I feel like I’m really rocking things in the treats department. 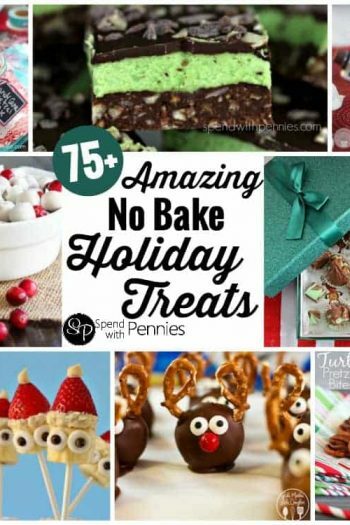 That’s mostly because I’m opting for a lot of simple, no-bake treats that can double as gifts for friends and family. 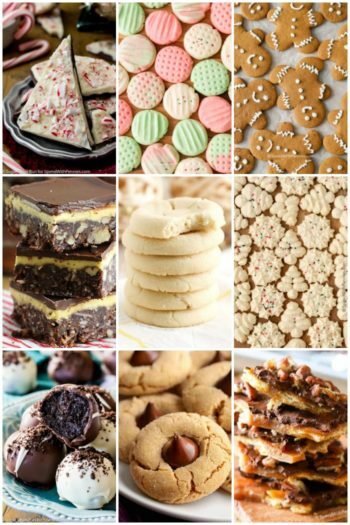 While I’m still doing my fair share of baking, by delving into no-bake desserts I’m able to double my output; multitasking by baking chocolate thumbprint cookies in the oven while whipping up a batch of peppermint bark fudge or gingerbread fudge on the stovetop. My newest no-bake obsession? 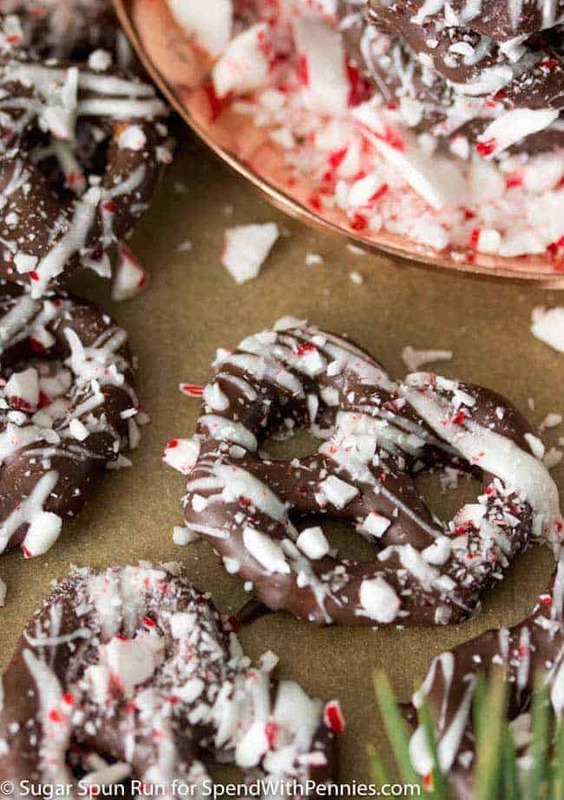 These peppermint bark pretzels. I think you’re going to want to give them a try, too. 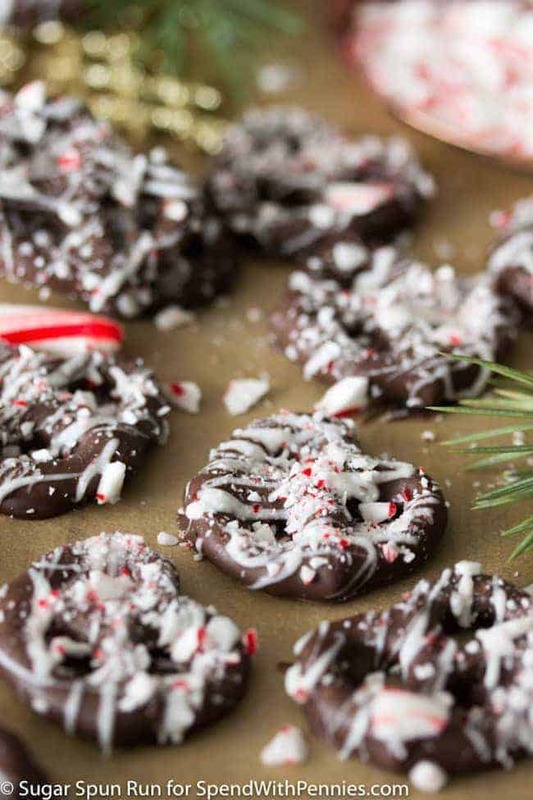 These peppermint bark pretzels are essentially chocolate covered pretzels taken to a whole new holiday level. 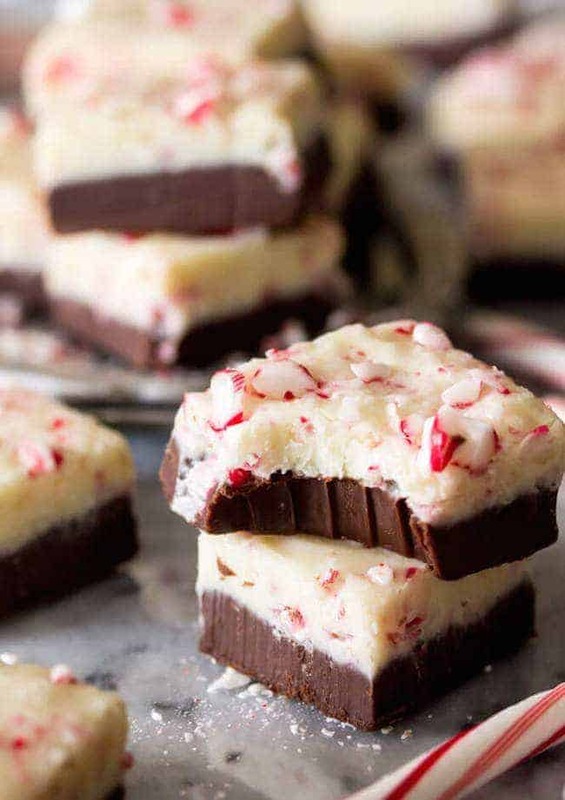 They’re drenched in dark chocolate and then drizzled with white chocolate, then speckled with candy cane pieces for a peppermint bark trifecta of flavors. I use melting wafers rather than regular chocolate chips to make these pretzels because they harden much faster than regular chocolate chips would. In fact, the chocolate sets so quickly that you have to make sure to stir your melted chocolate regularly as you’re dipping. I recommend working in batches of about 5 pretzels at a time — dredge a few in chocolate, immediately drizzle with white chocolate, and then sprinkle with candy canes before the chocolate has a chance to harden. If you do too many at a time the chocolate will harden before you have a chance to sprinkle with candy, and then the candy cane pieces won’t stick to the surface. 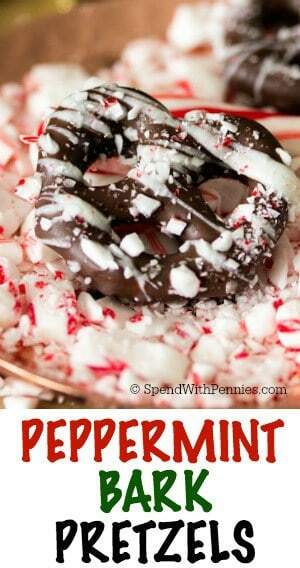 These peppermint bark pretzels are an easy, 4-ingredient holiday treat that double as a sweet edible gift! Prepare a large cookie sheet by lining with wax paper. Cover your prep surface with wax paper as well to catch any spills and for easy clean-up. Melt dark chocolate melting wafers in a medium-sized bowl according to package instructions. Likewise, prepare white chocolate melting wafers. 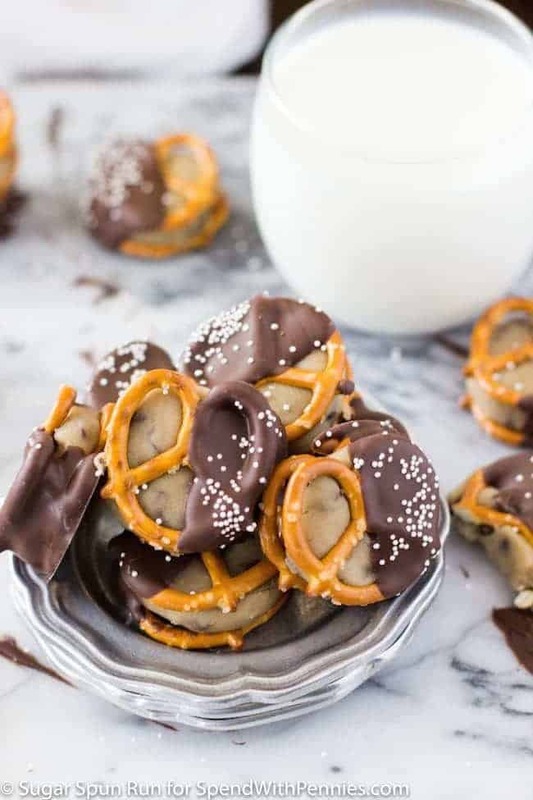 Drop a handful of pretzels into melted dark chocolate. Lift pretzels out of the chocolate one at a time, using a fork and tap against the side of the bowl to shake off excess chocolate. Slide onto prepared baking baking sheet & drizzle pretzels with white chocolate. 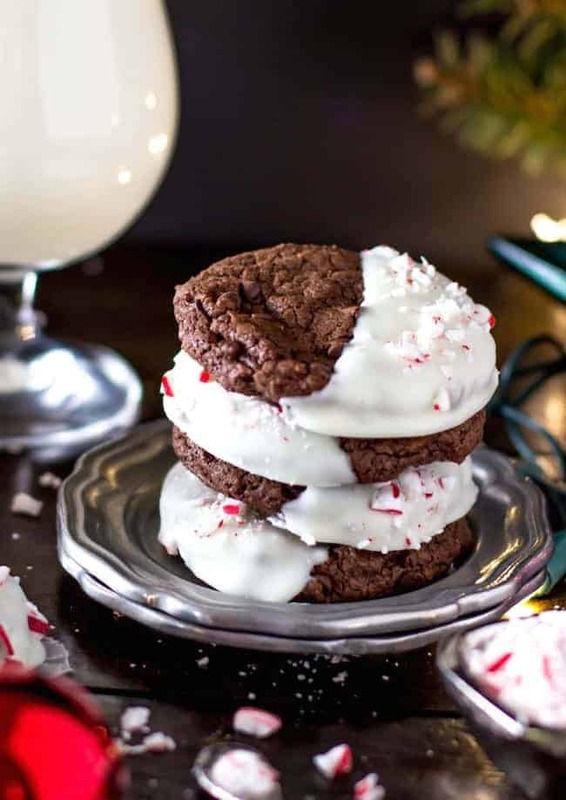 Immediately sprinkle with crushed candy canes (don't wait too long, or the chocolate will harden and the candy cane pieces won't stick!). Repeat until all pretzels have been dipped, drizzled and sprinkled. Allow to harden before serving (about 10 minutes).